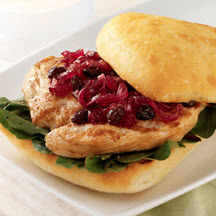 CooksRecipes has quality, kitchen-tested recipes for turkey sandwiches that you can count on for successful deliciousness. 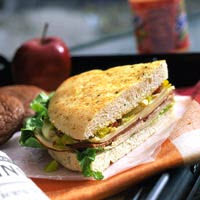 A meaty New Orleans' two-fisted sandwich piled high with everything but the fat in this tasty turkey version. Recipe courtesy of California Raisin Marketing Board. 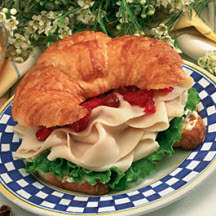 No an ordinary turkey sandwich here, this one is served on a croissant roll with a nutty marmalade cream cheese spread topped with cranberry sauce.